Arrow returned on the CW last night to quite a strong audience. In fact, it was the largest audience any season premiere has held since the show launched in 2012. "Green Arrow" drew in 2.6 million total viewers and a 1.1 rating, which is up in the demo from both last year's premiere and finale. Last night's audience of 2.58 million was the highest rated since the series premiere is 2012, which pulled in a 1.3 rating. 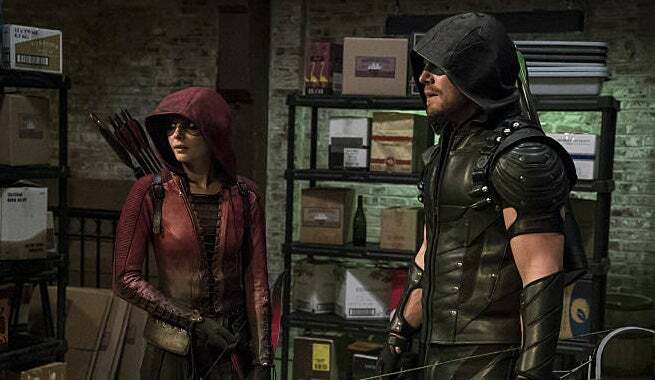 Arrow couldn't keep up with The Flash, though, which premiered its second season in the same DC TV universe on the CW Tuesday night, with 3.4 million viewers and and 1.4 rating. Arrow airs Wednesday at 8 PM EST on The CW.